The fact that cables incur loss is something often overlooked by the less-experienced users. Generally, the thinner the cable, the more the loss. Thus, the length of run you can make with antenna cable is primarily dependent on this loss. Examples: RG174 loses 27dB/100 feet at 700MHz. Thus, runs of only a foot or two are really practical—perhaps jumpers within a rack. On the other end of the range, Belden’s 9913F7 loses only 3dB/100 feet at 700 MHz. Thus, you could very easily use a 100-foot run without any RF amplification. Here again, less experienced users may see the “shark fin” type antennas and think they look cool, so they must be needed for the next installation. Like any other type of tool, the LPDA (log periodic dipole array) has a specific use because it is a directional antenna. If you have a wide area to cover but relatively short distances, dipole or other omni antenna types will probably perform better. However, LPDA antennas are great when you have a narrower angle to cover but a longer distance. Of all the things that will “guarantee a flawless operating wireless system,” frequency coordination is probably the most important. Not only do you need to leave enough space between your wireless operating frequencies and existing transmissions (like TV or other “fixed” transmissions), but also between your wireless mic channels. Generally, 300 kHz is considered the absolute minimum spacing, but 400 kHz or more spacing is preferred when you can. However, there is also the issue of inter-modulation. When you add several RF transmissions, you end up with new, unintended signals on mathematically-related frequencies. The only real way to avoid having these “phantom” signals cause you problems is to use coordination software to calculate your operating frequencies. Several wireless mic manufacturers offer such software, and there are third-party suppliers as well. 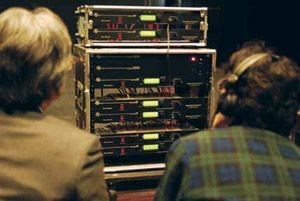 Just like with any audio system, a wireless microphone needs to be properly set for gain structure. Generally, the standard way to do this is to first set the transmitter by connecting its microphone, guitar cable, or in the case of the handheld—the mic is already connected. Turn the unit on and then sing, speak, or play into it at the expected sound level. The goal is to get as much modulation as possible before heavy limiting. In my opinion, a little touch of limiting is actually desirable—that way you know that you are getting the best signal before noise. Next, set your receiver’s output to match the intended input. If you are connecting it to a mixing console, ideally you should use the line input connection and set the receiver output accordingly. From there, set your normal gain structure as you would and you should have a nice, clear signal with low noise and no distortion. Karl Winkler is director of business development at Lectrosonics.